The weekend still arrived slower than ever after a Bank Holiday at the beginning of the week. I was excited to get down to Mustang Maniac to see what had been done to my car. The lower cowl was going to be replaced as it had rotted through and that piece of work was known about. With the cowl off the guys could see the fire wall and the back of the dash clearly in daylight. On full inspection of the dash they could see it had gone a little thin underneath and rusted pretty badly all along the inside. A discussion was had to either replace the whole dash, or weld parts onto the old dash. This would mean shaping metal and replacing the radio slot that is always butchered on the classic cars. The decision was made to replace the complete dash, not a cheap option but it was going to be worth it in the long run. As ever Adam had a full dash in stock and was fitted, welded and brazed into place. It’s a little difficult to see black on the dark underside but you can make it out. The top part of the firewall had to be fabricated as it was little thin in the top crease, so again it was decided by Terry to cut the top off the firewall and replace it with fresh metal and shape it to the new lower cowl. Metal work skills being displayed in all their glory and you can’t even tell it has been replaced. With the lower cowl now firmly welded in place it was masked up and then given the first of a couple of layers of primer. It was at this point I was sent this teaser photo by Adam to show the primer had been applied to the cowl, this is the first piece of fresh metal to get proper paint. 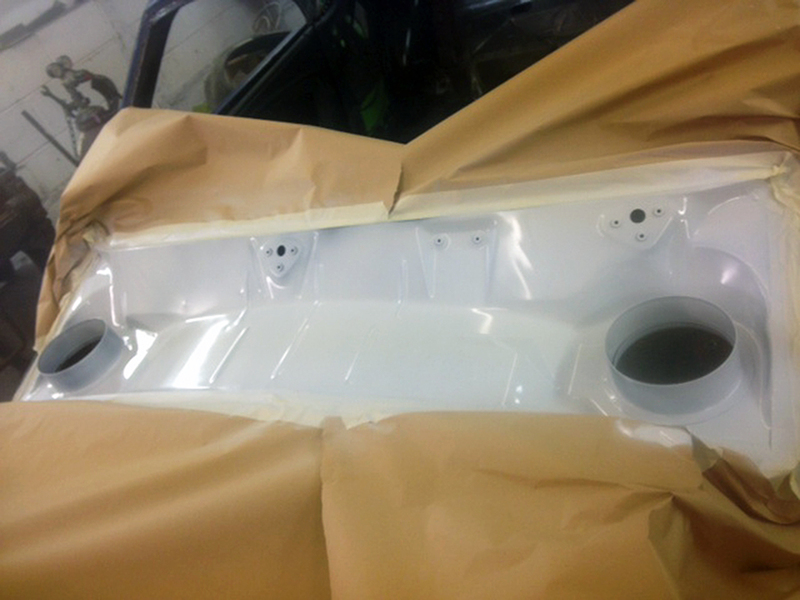 I turned up very excited and itching to see the car expecting to see the cowl in primer. I wasn’t disappointed the lower cowl was painted in the colour that I wanted, Acapulco Blue. Obviously I am biased big time here, but it’s a bit different and a stock ’67 Mustang colour, I am absolutely delighted with it. This was the first time I had seen the colour on my car. A pretty special moment. I got a bit carried away having a little bonding session with the fantastic paint job much to the amusement of the guys who followed me in to see my surprised look. Adam broke the news to me about the very busy day ahead of me. The trunk was to be removed and then strip it back to bare metal to see if there was any “little surprises” waiting for us as Adam puts it. What he means is, are there any pin holes or rust that have been covered up. I started on the top side and then worked my way to the underside. The underside took a lot longer due to all the corners and curves that made it hard work. I am pleased to say after a few hours hard work that the trunk is solid and no rust at all, except for a two very light surface areas where the paint had chipped off on the top side. The next job was to red oxide the inside firewall as I had stripped it back to metal last week. The end results are pretty amazing I must say. I was spoilt this week in my own little sanctuary, a nice guy Chris was given the dubious pleasure of working with me for the day. It’s normally quiet in the work shop, but last weekend it was a nice change to have somebody to share a conversation with all things cars. Chris made a great job of stripping the right side B pillar and the rear panel under the rear screen. Thanks for your hard work Chris. Throughout the day the normal visits from the guys was in full flow and towards the end of the day I was given some “homework” by Adam. That homework was to take home one of the fenders and strip it back to bare metal. Adam was right it was a busy weekend for me with a few more to come like it. Things have stepped up a notch, big time! Sunday, I got up with a full day in front of me and the backs of my legs aching. My homework was to be completed along with the trunk hinges and sprung bars that connect them to hold the trunk open. The hinges were to be stripped and all paint removed as it has to be painted the same colour inside the trunk. I though I would try to be clever to strip and clean the parts with the sprung tension bars in place. Unfortunately this turned out to be a nightmare so I had to remove the bars. I held one of the hinges in the vice and lever out the first bar. This was enough to start a cascade of events. The sprung bar unleashed itself like a coiled cobra and the end of the bar slapped me on the left hand at the base of the knuckle, the instant pain caused me to rub my hand as the other bar sprang away hit the man cave rubbish bin, this in turn was sent flying leaving a cloud of old sanding dust and rubbish all on the man cave floor in the doorway. After the initial clean up and the bruise on my thumb and wrist getting darker by the minute, I took the hinges back outside to complete the strip down. Both hinges came out pretty well and I was well pleased. To protect the inside of the hinges I gave a coating of Eastwood Rust Encapsulator to prevent additional rust on the inside of the hinges. The sprung bars were given an undercoat of red oxide and then a top layer of silver. The homework was a dilemma, how to remove the paint from the fender. I decided on my Dewalt dual action sander with a 100grit discs. I intended to go down to the undercoat and then use a lighter and lighter grades to get to the bare metal. Some of it went to plan and some of the paint came straight of and I went to the metal. I will have to fine buff the tiny swirl off the metal work now this weekend. The purpose of the homework? to see if there were any little surprises waiting for me. I am pleased to say I didn’t find any on this original panel so far. I still have the top edge to complete but that could be later in the week or next weekend. A big update again and a lot has happened, I intended to post on Sunday as normal. But, I had so many pictures to edit it was very late to start writing this little lot up. Forgiven? This entry was posted in Car, Photo's and tagged Acapulco Blue, brazing, cowl, cowl replacement, dewalt, Eastwood, fender, firewall, hinges, homework, lacquer, Mustang, One man and his Mustang, paint job, paint stripper, primer, red oxide primer, replacement dash, sprung bars, top coat, trunk, welding. Bookmark the permalink. Don’t worry about being late, so am I. I didn’t post last Sunday as so much to catch up on! Excellent progress. Your panels seem to be in great shape for their age and I envy the fact yours are steel so are slightly easier to get to bare metal. My alloy panels are too delicate for a sander as it causes deep scratches in the metal which you don’t get as badly on steel panels.